For the full list of exclusions, kindly refer to our Product Disclosure Sheet, available for download below. If the Insured commits suicide within 1 year from the Issue Date or any date of reinstatement, whichever is later. Any illness other than diagnosis of Cancer. The signs or symptoms of Cancer is manifested prior to or within 60 days from the Issue Date or any Reinstatement Date, whichever is later. Your age is 17 and below OR age 51 and above. * After Therapy Care Benefit payout, policy will end. 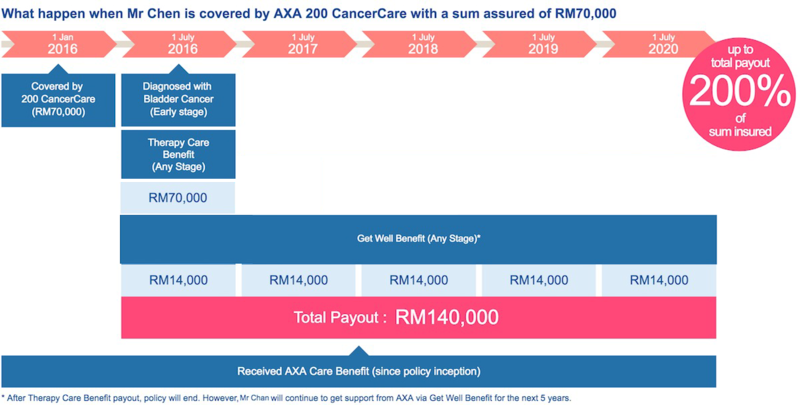 However, Mr Chen will continue to get support from AXA via Get Well Benefit for the next 5 years. Why do you need cancer plan? Still not sure yet ?